[Spectre Admin] The charging connector on Iridium Go (Internet modem) has finally gone. 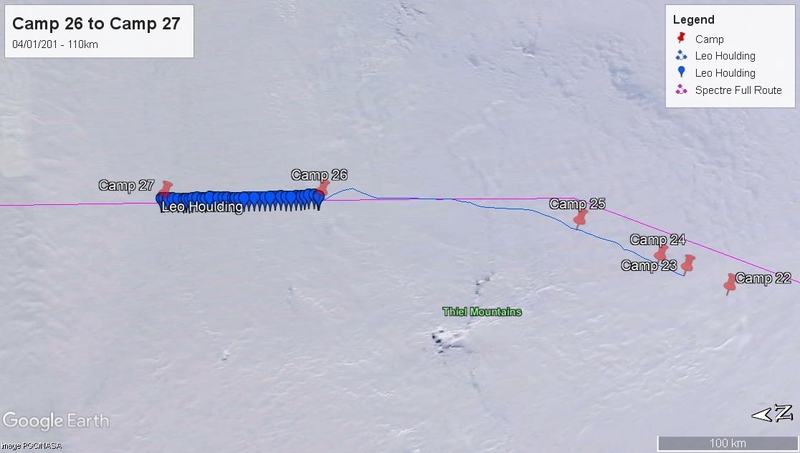 The team have a spare battery that they are hoping will last them until their arrival at Union Glacier. So hopefully they can still send daily reports, but unfortunately without the photos. We started off on our medium 12m kites with 25m lines. Trying to loop the kite downwind is difficult as it soon crashes into the ground because of the short lines, so Jean is busy modifying line sets to optimise performance for tomorrow. The wind eased and we switched to the big 15m Chrono’s on 65m lines. Right on cue the surface smoothed up and we enjoyed a relaxed final few miles before she dropped to zero. Today the sequins were shimmering in the sky – Ice crystals on the wind, sparkling like glitter catching the sun. We are happy to be making meaningful progress on a fun ride. There is no rush for this to be over , but at the same time I can almost taste the fresh food and beer waiting for us 420km away in Union Glacier. Our time out from that other world, from our other lives, is drawing to a close. Post-Spectre Exped thoughts are starting to enter my mind for the first time in months, years even. There’ll be a massive amount of follow up to deal with, but I’m thinking more about fun activities and micro adventures at home with the kids. But for now, and the foreseeable future, we must stay focused on this mega-adventure. A momentary lapse of concentration is all it takes whilst kiting to drastically change the situation. Especially when travelling at the kind of speeds we’re getting used to. So, steady as she goes and who knows, maybe there be beers and medals before the end of next week? Another day closer. As you say, that other world is getting closer, so enjoy the last days of your adventure – surely a once in a lifetime experience. Hope you have more of the great kiting that you’ve dreamt about for months, it will be a lovely way to finish. Take it easy, but take it! Iridium, so it’s Garmin InReach Explorer+?. No worries; your descriptions make up for the lack of photos. I have just found the location of Hercules Inlet on my small scale map and I like the little blue”millipede” on your diagram heading straight for it!! The last two blogs have been so exciting, we’re delighted for you!! !